Denzel Washington and his Training Day director Antoine Fuqua celebrated the latest chapter of their ongoing partnership on Monday night with the New York City premiere of their new film The Equalizer. Both Washington and Fuqua stressed that their prior collaboration, on the 2001 film for which Washington won the best actor Oscar, helped them quickly get into a groove. "We know each other, so there's a shorthand. And he knows what he's doing, so I don't have to worry about what he's doing; I just have to worry about what I'm doing and come to work with a fully realized character," Washington told The Hollywood Reporter on the red carpet. Later at the afterparty Fuqua said it was almost a seamless transition, despite the decade-plus gap between the two films. "We can collaborate together equally," the director told THR. "Obviously Training Day helps, but it's all about trust. It was like we never stopped working together." The two also confirmed that they would be working together again, next year, on The Magnificent Seven. The Equalizer, which is getting an Imax release Friday, played in the giant-screen theater at the AMC Lincoln Square in Manhattan. 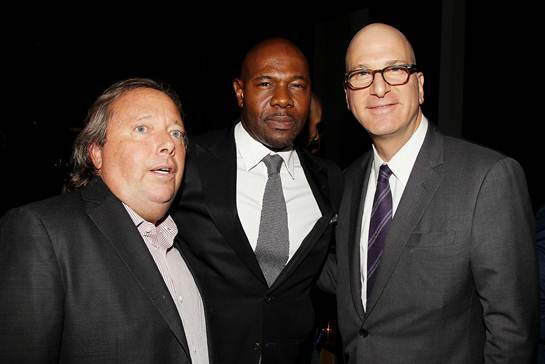 Imax CEO Rich Gelfond and Imax Entertainment CEO Greg Foster, who were on hand for the screening and posed with Fuqua in the photo below, said that Fuqua's films are well suited to their format. "The way [Fuqua] shoots movies … they're kind of moody and [have] big scope and action to them. Great sound — sound's a very big part of his design and that's important too. It really lends itself to what we do," Foster said. Gelfond added that Fuqua's films are "the kind of movie that directors … say, 'We want audiences to be part of the movie.' "
To read more about The Equalizer in IMAX visit The Hollywood Reporter.